Russia’s news channel RT is the first to reach that milestone: It reaches 1 billion views on YouTube. “This is a fantastic achievement,” said Google vice president and global head of content, Robert Kyncl. “We are very proud and glad that RT has hit this figure. A billion views is a milestone to which many people aspire. Attracting an audience and interesting viewers to make them come back to you again and again — and getting such a rating — is an outstanding achievement,” read the press release that the newspaper obtained. “A billion views is a staggering result. From the first day of RT, we realized that, in the near future, the scramble for the audience will focus on the Internet, on new platforms. That is why we are proud to be the first in the world. 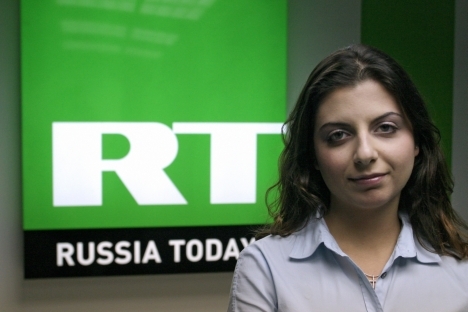 It is a fantastic achievement for a Russian news channel to become a provider of news, where news is watched by a young audience — the audience that will shape the world agenda tomorrow,” said RT’s Chief Editor Margarita Simonyan. “The success of RT on YouTube highlights the fact that users appreciate legal, quality, professional and Internet, audience-oriented content,” Google Russia’s director general, Yulia Solovyova, said. Video RT was named the most-watched video news on YouTube in 2011. A year later, the American Pew Research Center named RT the main generator of news content for YouTube. RT has produced 22 of the 260 top videos, outstripping Fox News and BBC more than twofold. RT’s profits from its partnership with YouTube have already topped $1.8 million. The article is first published in Rusian in Rossiyskaya Gazeta.